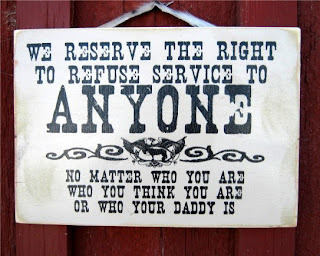 You know those ubiquitous signs in restaurants, shops, and virtually every business you've ever walked into that read "We reserve the right to refuse service to anyone"? Have you ever seen a similar sign in any hospital? Wouldn't life be grand if doctors could post such a sign right smack in the middle of the hospital front entrance? 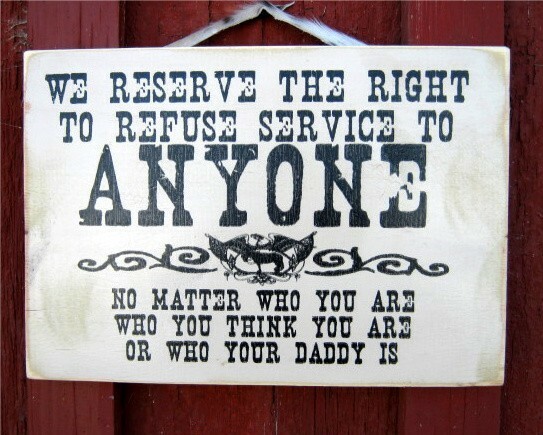 A legal website I happened upon discussed the ramifications when restaurants hang up these signs. It makes several points about the rights of restaurants to refuse service to patrons. I had to chuckle when I read the conditions. I'll list them here and contrast how hospitals are operated differently from food purveyors. Patrons who are unreasonably rowdy or causing trouble. Have you ever been to the Emergency Room on a Saturday night? Patrons that may overfill capacity if let in. Patients are lined up in the hallways in gurneys and wheelchairs and yet we still admit more into the hospital. Isn't amazing how the fire department will conduct strict capacity inspections of establishments like restaurants, movie theaters, and Cowboy Stadium, yet turn a blind eye to fire safety when hundreds of people are packed into ER's? Patrons who come in just before closing time or when the kitchen is closed. Well, we never close. Even when every hospital bed is full and nurses are walking off their jobs from sheer exhaustion. Unlike waitors and busboys, we are expected to keep working no matter how many patients we can care for safely. Patrons accompanied by large groups of non-customers looking to sit in. If we did this every extended family member and gangbanger bro who tries to come in with their "innocent bystander" gun shot wound victim would get locked out, leaving a terrible situation for our overwhelmed and underpowered security officers to keep peace. So let them all in. Patrons lacking adequate hygiene (e.g. excess dirt, extreme body odor, etc.) Ha ha! You haven't lived until you've smelled pus and stool and who knows what other body fluid on a homeless man who hasn't bathed for weeks and comes in with wet gangrene of his crotch. Now which business would you rather be running, a restaurant or a hospital? I think opening a Burger King franchise may not be such a bad idea.